Please send me more information on Cabo Sails! For sailing enthusiasts, it’s hard to beat the romance and adventure offered by Cabo Sails with 15 years of experience providing their guests exceptional quality and service. Charter your very own private sailboat and enjoy your time however you wish…sailing, whale watching, snorkeling and sightseeing all on your own schedule while you discover this extraordinary paradise. You will enjoy sailing in the Pacific Ocean, Sea of Cortez and Cabo San Lucas Bay and seeing the magnificent rock formations of Land’s End, Lover’s Beach and Cabo's most famous landmark, El Arco (Land’s End Arch). Experience the thrill of sailing at the tip of the Baja Peninsula where the cool westerly winds of the Pacific Ocean meet the warm waters of the beautiful blue Sea of Cortes. If you would like enjoy some time snorkeling, this activity is offered at Pelican Rock in the Cabo San Lucas Bay near Lover’s Beach. The snorkeling equipment is on board and is included. Los Cabos is one of the most spectacular whale watching destinations in the world. 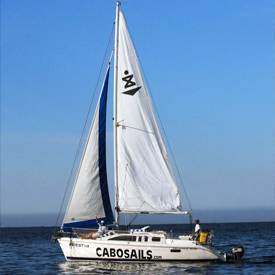 Cabo Sails offers private Eco whale watching tours in a fun and respectable environment mid-December through March. Available for special occasions, birthdays, bachelorette parties, engagements, anniversaries and more! Note: Extra hour charges are paid directly upon check-in. All sailboats have engines for motoring, restrooms, music, MP3 or iPod connections and life vest for guest 5 and older. Arrive at the Cabo Sails office located in Plaza Mexicana (previously named Plaza Gali, behind OXXO Market) 30 minutes prior to tour. 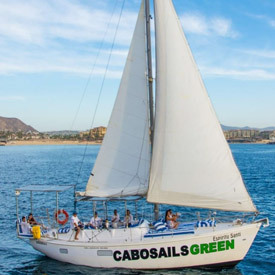 A particularly wonderful experience is to enjoy sailing on board this 100% solar-powered electric 44’ Espiritu Santi sailboat which offers you an eco-friendly experience that creates a peaceful ambiance as you help keep Los Cabos waters blue and pristine. Children (age 0-12) are complimentary (max 5 free). $35 per child after the 5th child. Wet suits are offered upon request only for no additional cost. Vegetarian and Gluten Free food options available. Cabo Sails can accommodate any food allergies or special requests. Gratuities for the crew are not included and are most appreciated. Your safety is the number one priority. 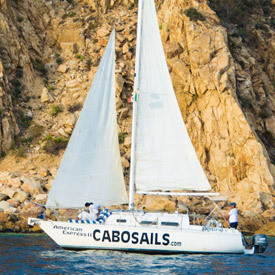 Cabo Sails specializes in a smooth sailing experience and not extreme sailing. 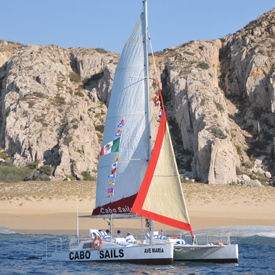 Cabo Sails has all of the permits, insurance, licenses and safety equipment required. They also have life line netting all around the decks of the sailboats for additional safety, especially for children.